Long before the Old Man plugs his Major Reward into a socket and lights into a reverie that channels Susan Stroman’s kick line of old ladies with walkers, it’s clear that “A Christmas Story, The Musical!” is written by a team that revels in themes from both childhood and Broadway history. The sleek and fast-paced show based on Ralphie’s quest for a Red Ryder Action Air Rifle BB Gun is clearly serious business for a group of commercial backers whose Broadway credits include “Frankenstein: The Musical,” The Drowsy Chaperone” and “Spring Awakening.” The sets, lighting, sound and musical supervision are all done by people with great big bona fides. Work on this show began in 2009 in Kansas City and continued out of the limelight in half a dozen regional capitals. (Thank you, “Spider-Man,” for the object lesson in why that’s wise.) And the casting is top drawer. So here’s a production that knows its audience, hits its marks and aims full out for The Great White Way. Will it get there? I think so. Because at the heart of “A Christmas Story, The Musical!” are some new creative voices that will not be denied. 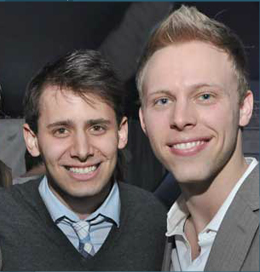 Lyricist Benj Pasek and composer Justin Paul wrote “Be My Friend,” the Facebook song, when they were 19-year-old students at the University of Michigan, and they are just now at the midpoint of their twenties. They’ve already written for Disney and they have produced another musical on a childhood theme, “James and the Giant Peach.” They jumped into the “Christmas Story” project early on, but it wasn’t theirs from the beginning, so they are in a very real sense working for somebody else in a project that closely follows the beloved movie based on the legendary story by Jean Shepherd. They will probably look back on this whole time as a pivotal learning experience, both heady and sobering, to be thrown in so early with old pros. A YouTube video of Pasek and Paul singing an excerpt from “James and the Giant Peach” confirms that these are two fortunates who don’t need to remember what it was like to be kids. They never had the kids kicked out of them in the first place. Blessed with abundant talent, ready humor and seemingly encyclopedic grasp of the musical tradition, they are a team to be reckoned with. 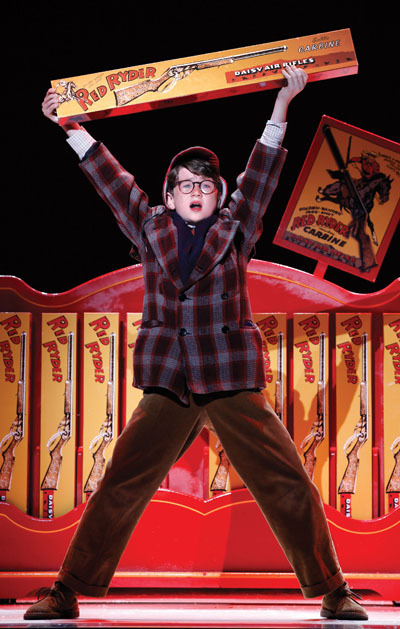 The show’s other great kid is Clarke Hallum, as Ralphie. Hallum’s a multi-talented pre-teen who first played the leading role in the Seattle regional run a season ago. The time window’s not large for casting these parts, and Hallum’s now 12 and at his peak. He’s a wonderful singer with a clear, soaring voice and precocious technique. He’s also a fine actor, completely convincing as a 9-year-old who matures with cunning as he tests the limits of his circumscribed world and finagles to get that gun, and yet who collapses gratefully into the bliss of his mother’s protecting arms when all seems lost. The story hangs on Ralphie. There are two of them, a young one and an old one. Chicago actor Gene Weygandt is Jean Shepherd, the velvet-voiced radio show host who’s re-living the story of his childhood, assisted by a foley guy. (Nick Gaswirth can bark like a mean pack of dogs, slam doors and bang garbage cans with the best of them). Weygandt captures the feeling of having a childhood memory so perfect you can almost step into it. Indeed it seems quite normal to see him become a participant in his own story, play bit parts and cheer his younger self on. The Old Man is a cussing wonder but a boy at heart, and the rubber-limbed John Bolton is hilarious as he is transported to terpsichorean ecstasy over the leggy lamp, which validates the genius of his brain on puzzles. Rachel Bay Jones is radiant as the Mother, the embodiment of pure love remembered, with a little ditzyness thrown in for good measure. And she’s got a great song to sing — “Just Like That” — about the fleeting moments we should cherish. It’s bound for a long life beyond this show. Book writer Joseph Robinette nails Shepherd’s tone and conductor Ian Eisendrath has the cast and orchestra in fit musical shape. Director John Rando and choreographer Warren Carlyle come through with excellent child-focused numbers such as “Ralphie to the Rescue,” his daydream about all the jams he’ll un-jam once he’s got his BB gun, and “Somewhere Hovering Over Indiana,” for all the kids during their Santa vigil on Christmas Eve. There may be further tightening and tweaking. A few of the references to other Broadway shows, especially to “Wicked,” seem unnecessary. The family’s Santa visit to Higbee’s Department Store lacks punch (no fault of Santa’s) and the iconic Chinese restaurant scene is awkward in this telling. But these are small things. One would guess that Peter Billingsley, the bespectacled star of the 1983 movie, and one of the producers of this tour, is enjoying the experience. And to paraphrase the show’s theme song, with next year’s Christmas season only 31,556, 926 seconds away, it’s almost nearly getting close to counting down to whether to bet on Broadway.